Caffeine is also known as 1,3,7-Trimethylxantine, its chemical formula is C8H10N4O2. Caffeine has 49.48% composition Carbon, 5.19% composition Hydrogen, 16.48% composition Oxygen, and 28.85% composition Nitrogen. Caffeine's molar mass is about 194.19 g/mol. Caffeine is found in common food and beverages that we consume every day, such as coffee and tea. Caffeine is a white powder in its pure state and is crystalline. Caffeine melts at 238 degrees celsius. Caffeine has a boiling point of 173 degrees celsius. Caffeine dissolves in hot water. The density of caffeine is 1.23 g/cm^3. In its pure state it is odorless and has a bitter taste. 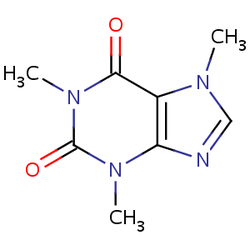 Caffeine has a pH of 6.9, making it almost neutral, but slightly basic. Caffeine is soluble in Pyridine, hot water, alcohol, acetone, ether, chloroform, and benzene. Caffeine is efflorescent in the air. This is a video that explains how caffeine works within the human body.